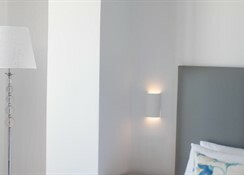 The Orion Hotel features double/twin rooms that can accommodate up to 3 people with private bathroom facilities (shower, WC), double or twin beds, fridge, air conditioning (included in the rates), safe (extra charge payable locally), Satellite TV, and a balcony or terrace with a choice of inland, pool, or Sea views subject to availability. Free baby cot is available on request. The Orion Hotel rests on a mountainside with breathtaking panoramic views of the popular resort of Kamari on the island paradise of Santorini. This friendly 3 Star property is secluded yet with easy access to the black sandy beach of Kamari just 250 m away, ideal for swimming and water sports. The beach area also has many shops bars and restaurants. The cleverly designed Orion Hotel is bright, spacious and well equipped, offering double guestrooms with modern amenities and warm hospitality from the professional staff. Monolithos Airport is 4 km from the Orion Hotel. Local Tips: Kamari beach is an inviting black sandy beach, characterized by an enormous rock called Mesa Vouno that rises from the sea. Food, drink and entertainment: Bed and Breakfast accommodation. The Orion Hotel has a pool bar, snack bar, sitting room, and TV lounge. 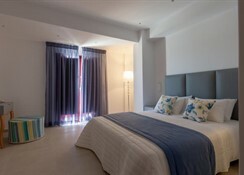 Sports, games and activities: Swimming pool, sun beds, umbrellas, garden. Water sports available at nearby beaches. Additional: Reception, safe deposit boxes (extra charge payable locally), laundry service. First holiday without the kids to celebrate our Silver wedding anniversary, and this was Perfect , Hotel was lovely, staff friendly, delicious food, rooms are spotless, beds are comfy, clean pool, well situated, 5min to a buzzing beach front, hire a quad to get around this beautiful island !